Apple released their sixth beta of iOS 12 last week and now we have some speed test videos of OS 12 Beta 6 vs iOS 11.4.1. 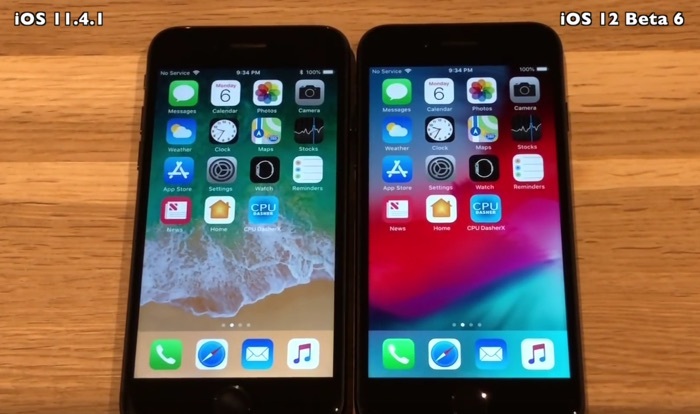 In the videos we get to see the iOS 12 Beta 6 vs iOS 11.4.1 on the iPhone 5S, iPhone 6, iPhone 6S, iPhone 7, first up is Apple’s iPhone 5S. As we can see from the video the handset running the new iOS 12 beta 6 booted up a few seconds faster than the device running the current released. The new beta also appears to be faster in some of the apps, next is the iPhone 6. With the iPhone 6 the device running the new iOS 12 beta 6 booted up faster, it also appears to be slightly faster in some of the apps. Next up is the iPhone 6S. As we can see from the video the iPhone 6S running the current iOS 11.4.1 software booted up slightly faster than the device with the new beta. The two handsets appear to be about the same in the apps, finally we have the iPhone 7. In the video of the iPhone 7, the device running the current iOS release booted up faster than the handset with the new beta. The two handsets also appear to be about the same in the apps. Apple’s main focus for their new iOS 12 is to bring speed an performance improvements to the iPhone, including older devices. We are expecting the software to launch some time in September along with the three new iPhone X handsets.